I wrote that title thinking the alliteration was catchy but now I’m saying it out loud and thinking it sounds dirty. It’s not, I promise. No hidden meanings, just legitimate sandbags and salads over here. I’ve been Bodyrocking for almost 3 weeks now and a lot of the newer workouts utilize a sandbag. There’s usually modifications you can do with just bodyweight or sometimes when possible, I’ll pick up a 10 or 15 lb. dumbbell and use that instead but it would obviously be easier if I just had the actual equipment they are using. Well, said “equipment” comes with a $100 price tag…FOR A BAG, the sand’s not even included. I have my limits and that’s one of them. After reading Christina’s post about how she filled hers, I was determined to make my own. Step 1: Drive to my local Asian ghetto grocery store and ask them for their cheapest 20lb. 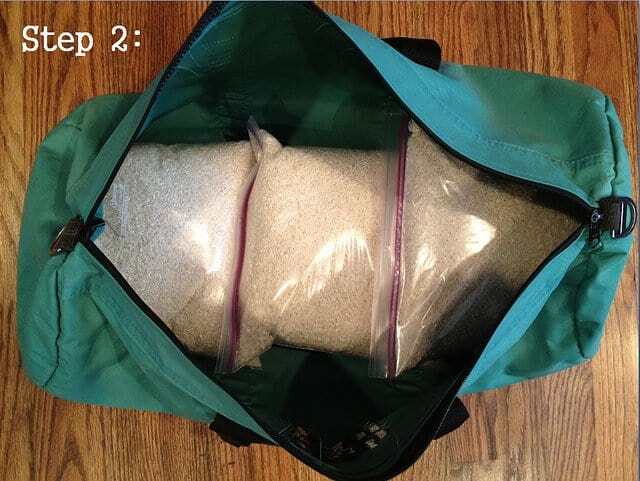 bag of rice. Avoid trying to be talked into the 40 lb. bag by trying to tell the kind non-English speaking woman it’s not for eating and I don’t need that much. 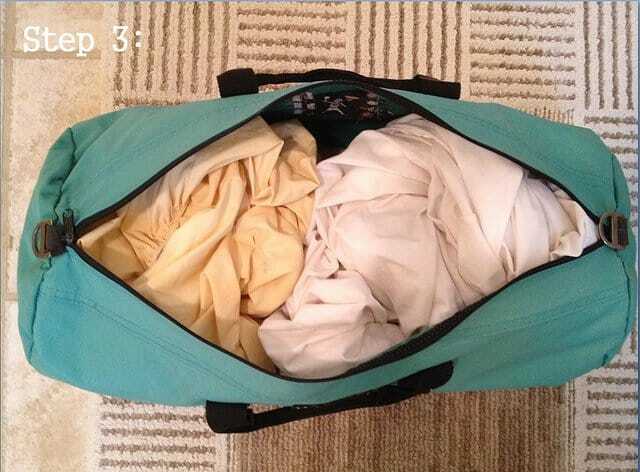 Scavenge the garage for the duffle bag that has held a bunch of sheets used to line the back of an old SUV when Ginger was in it for the past 3 years and clean it out. Step 2: Make a mess in the kitchen filling 3 large plastic bags with 20lbs. of rice. Step 3: Fill up the empty space with aforementioned sheets (now cleaned) so rice bags don’t bounce around. Et voila! All for $11.34. Sandbag turned into a rice bag and $88 saved which is nice because I did actually order the equalizers they use which are not cheap. Couldn’t quite figure out how to come up with a good makeshift version of those. It should be noted that 20 lbs. feels light until you start doing sumo knees with it. Also, if you want a killer work out and to literally not be able to do anything but hobble around your house for the next 2 days (I’m currently waddling like I’m 9 months pregnant my glutes are so sore) I suggest these two workouts done back to back. O-U-C-H. This salad has absolutely nothing to do with the sandbag besides the fact that the pineapple was purchased at the same time as the rice after reading Angela’s post and needing some tropical-ness in my life. Guys…this dressing is oh-my-word delicious. It’s like a pina colada jumped into your salad bowl. I could’ve seriously drank it straight from the blender. 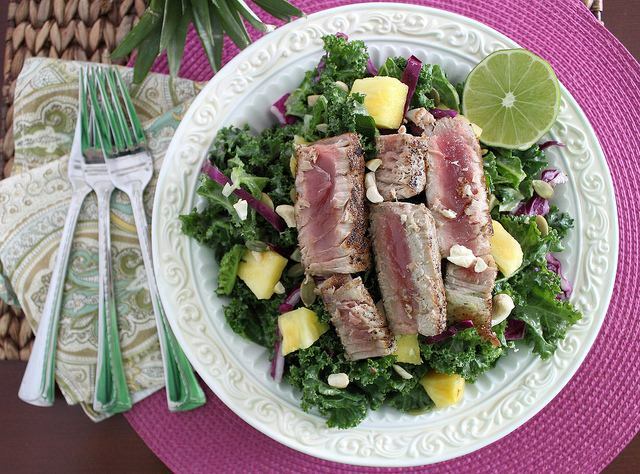 I made the dressing exactly as written but did my own thing with the salad including some seared Ahi tuna on top. It was like one giant F-you to the 3 inches of snow outside and I loved it. If someone won’t oblige to my tropical vacation requests, I’ll just have to take matters into my own hands. Now I just need to figure out how to bring this with me to Seattle tomorrow where the weather is supposed to be one lovely streak of rain/snow and mid 40s…glorious! And that concludes our Saturday randomness. Enjoy the weekend! Awesome!!! I love it! 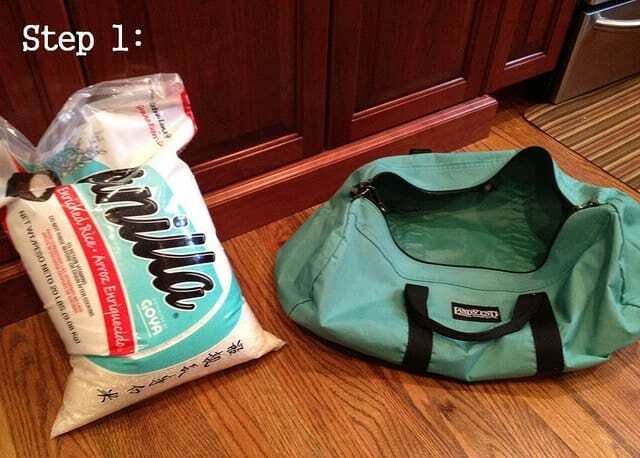 So happy you were able to create a makeshift sandbag. I’ve seen people do the same thing and it totally works. SO much easier when you have the equipment! Happy bodyrocking! Whoops. Spelled my name “Chritina” in the first comment…haha! Have a great weekend! Thanks for the sandbag tips. I’ve been thinking of making my own, but I’m pretty lazy. 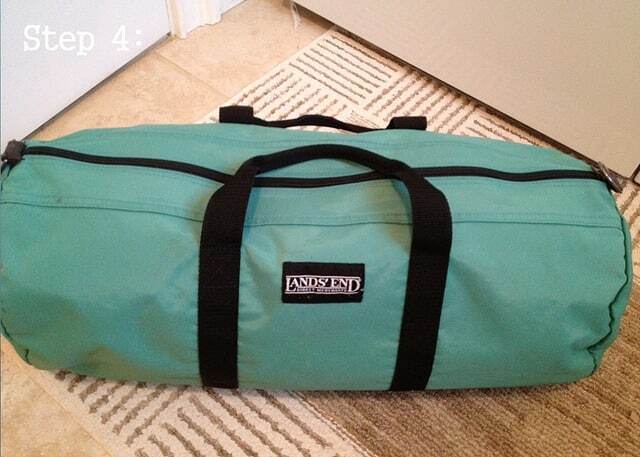 When I do those workouts I fill my duffle with textbooks and handles of vodka…. no joke, they are the heaviest things I can get my hands on hah. This is such a great idea though, i need to make one! And those equalizers are so tempting to buy. I usually use two chairs and so far have been able to do most everything but there are definitely some moves made for those. Great idea!! I love that!! Haha, I wish I could have seen the look on the ladies face when you told her you were buying rice, but not going to eat it. I can understand the confusion! That salad looks delicious! Love the innovative sandbag! Whenever I think of resourceful things like that, I fall in love with myself. You’re going to Seattle? Check out the Alibi Room restaurant by the gum wall at Pike’s Place Market for good pizza and beer. Also Habesha Ethiopian Restaurant in Belltown. And if you have time, go to the Queen Anne area… Beautiful neighborhood with lots of delicious coffee shops and restaurants. Thanks for the suggestions! Unfortunately, most of my time will be spent in the conference rooms of the Westin for a work conference :( But I will try and check some of those out! I’ve been to Pike’s Place a bunch of times so I’ll look for the Alibi Room this time around. The Alibi Room is pretty hidden, so look carefully. It’s kinda across the gross gum wall. It’s like a pina colada jumped into your salad bowl = I am all about that!!! I saw her recipe and wrote a comment similar to that. Thanks for reinforcing I need this in my life! 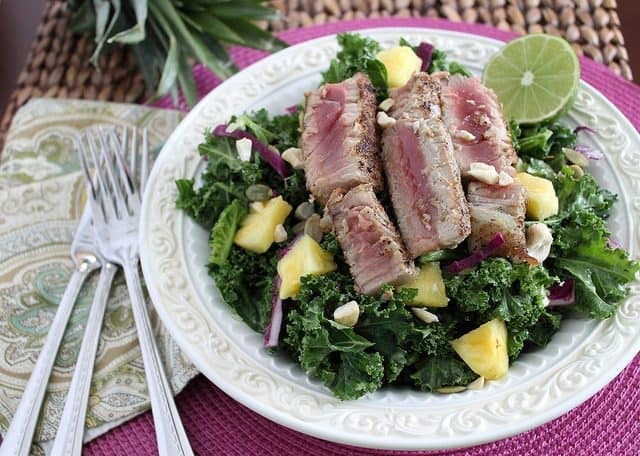 Mmmmm…love the addition of tuna to that salad– I love me some Ahi. Have a great Saturday! I was watching the body rock videos on YouTube, Im going to try it today!! Great job doing 2 workouts. That salad is totally drool-worthy. I got so excited when I read Angela’s post…the dressing looked to die for. I’m glad you have the proof! haha that is smart, you just saved me $100!! !